Journalists at the Los Angeles Times must be kicking themselves. "What could have been?" A "shadow" newsroom operating to undercut the newly unionized staff, a "frat boy executive" with a history of sexual harassment, phones and emails monitored, constant layoffs, editors suspended and escorted off the premises. Five publishers in five years. Three editors in chief in three months. It didn't have to be this way. But when offered a liberator, the Times flinched. In fact, half the newsroom said they would have quit if the Koch brothers had bought the paper back in 2013. Too bad. Who better to take the reins than a champion of organized labor? I guess the Times didn't care about its diversity or feminism or the benefits to its arts and culture section. Not to mention what it would have done for job security. After not selling in 2013, Tribune Company, which owns the Times as well as the Baltimore Sun, Chicago Tribune, and New York Daily News, decided to separate its newspapers from other media broadcasting into a new company Tronc, which is somehow short for "Tribune Online Content." It all sounded very "making the world a better place," full of corporate niceties that really meant journalists would be replaced by AI bots. More layoffs followed. 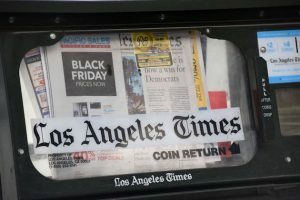 The "ongoing drama" continued on Monday when the Times announced Jim Kirk would replace Lewis D'Vorkin as editor in chief, after only three months at the paper. The news followed the suspension of Times publisher Ross Levinsohn, who was put on leave following an NPR report into allegations of decades of sexual harassment. In multiple sexual harassment lawsuits, Levinsohn said he wondered whether a woman who worked for him was a stripper on the side. Worst of all, Levinsohn told an executive he could not attend a lunch honoring the fashion industry because he "would have to be surrounded by gays—using a vulgar epithet for them." This would never have happened under the Koch brothers, who have a long record of supporting gay rights. Nor would journalists have to be worried about Levinsohn's "Gravitas with Scale" plan, a "shadow newsroom" as a "way to work around the newly unionized Times." Take the Koch brothers' ownership of Georgia-Pacific, the maker of Brawny paper towels and other consumer goods. Aside from offering "among the best-paid manufacturing jobs in America," 80 percent of its mills are unionized. Koch Industries has "positive and productive collective bargaining relationships with its unions," according to Politico. The Kochs also reject lavish behavior, unlike Michael Ferro, the chairman of Tronc. "As journalists get stiffed on raises, Tronc's chairman bags another $5 million for private jet and ‘expertise,'" the Times NewsGuild griped after Tronc awarded Ferro a multimillion-dollar consulting fee. Aside from requiring 90 percent of Koch Industries' profits to be reinvested into the companies, the Kochs "reshaped Georgia-Pacific's corporate culture," starting "almost immediately by moving senior executives out of the lavish offices on the 51st floor." "The Los Angeles Times is like a Soviet circus right now," one employee recently observed. A far cry from Kochtopia.